Discussion in 'Xbox One Tutorials' started by Xandrel, Nov 24, 2013 with 76 replies and 56,509 views. Figured as my first post in the community I would share my 'fix' for the new chat connector. I have a Turtle Beach X12 headset that I use for my online gaming. I was soooooo happy to see that the new XBOX One would not 'support' the old style connectors and that a 3rd party would have to develop an adapter. I didn't want to wait around for this adapter, nor do I want to pay for one either, so I scavenged around the house and found all the necessary parts to do it. Take a look. Rip that sucker open (and turn the soldering iron on). At first glance, you will notice that there are no visible screws (same with the controller for that fact). 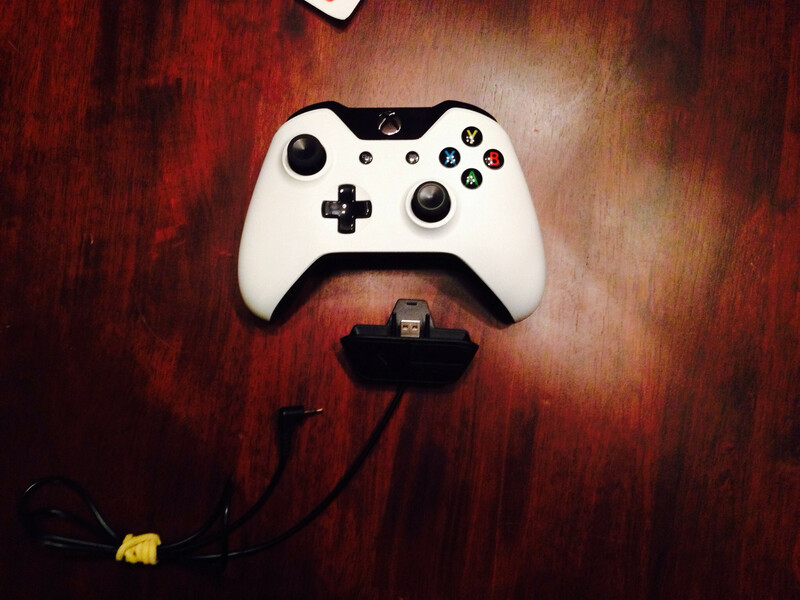 The back cover with the clip that holds the adapter onto the controller is held in with retention clips. Grip firmly, putting most of your pressure at the base, and pull. It should just snap off. With the back cover off, you can now see 5 screws (2 silver, 3 black). Remove those (T3 driver right here). Now, SLOWLY, separate the plastic covers. On my headset, they separated quite easily, but I can see some people having issues (maybe not). What I mean by issues is that the cable coming from the mic may pull away from the solder points on the board. Dont want that to happen as it can screw up your traces. You will expose the board and the wires that connect the headset to the board. Use your soldering iron to remove the 4 wires. Now, do whatever you want with the mic. I will add a male 2.5mm connector so I can still use it should the need arise. You can see that M$ was kind enough to have the pinout labeled for us. Ground, Mic, and either of the other 2 pins is what you want. Now place your female plug that you selected for the project. Remember, 2.5mm. I selected mine from a cellphone I had laying around the house (Sanyo something or other, flip). Its very small and will fit inside the casing very nicely. Once I decided on how to place it, I put a generous amount of hot glue on the board and set the plug in place. I got a little carried away here and forgot to take pictures of parts of the process, but it is pretty self explanatory. Ensure you know which pins are which. I used a multimeter to check the continuity of each solder point. I used this image as my reference. This is what it looked like when completed. Soldering wasn't the greatest work that I have done, but it worked. I finished it off with a bunch of hot glue to ensure that it wouldn't move once it was all put together. I had to chip away at the plastic piece that covered it all in order for it all fit properly. Do that if you need to (remember that this all depends on which connector you use inside). Screw the plastic cover back on and try to attach the finished cover back on (you may have to do some cutting or shaving to make it fit, I did). Overall I am very pleased with how this worked out. It looks stock. Now I can use my Turtle Beaches during my sessions of Ghost. Love it. This goes without saying, you can use your old 360 mic or any mic with a 2.5mm connector. Enjoy. Good job, glad to see people coming up with their own way of fixing the problem. I'm glad to see people still know how to do things like this. It seems like most "modding" these days is low effort with tools to do everything for you. Mad props to you Xandrel. BTW, you can press the report button and ask for a mod to move the thread. They would be glad to do so! Looks like you did a great job though. Good work! I believe TB makes a converter. Not %100 sure though. I think this should be stickied This is great for those who don't want to buy another Headset/Adapter. solder it perfect couldn't get it to work for an hour; than I just kept putting the male deeper in and out till I could get both the mic and the voice chat to work, and finally found a spot where it works. I ordered a few of the female jacks in order to do the mod perfectly each time. Check these out. I also ordered these to get the M$ mic going again in case of a rainy day. According to some other mods floating around, I soldered my mic wire to the the mic ground trace. My set is working perfectly, so I am not sure what to say about that. [DOUBLEPOST=1385352837][/DOUBLEPOST]I thought I had this in the Mod section. Any way to move it there? Do you know if theres anyway to make something like this for a pair of bluetooth XP400's?? Im not sure how to answer your question. The 2.5mm cable is pretty standard across the gaming chat community. The connector that the XBOX One module connects to is a custom plug, not HDMI. It would be some sort of rendition of a USB cable or something along those lines. Essentially what I have done is changed this module to work the same as a 360 controller did. If your headset worked on the 360, it will work with this. Hope I am explaining myself, maybe somebody could help me out if I am not. Pretty neat, you could probably make and sell those on eBay. I did something relatively the same, but instead of messing with a jack I just soldered the 2.5mm wire directly to the headset pad to make a connection to my Astros. You can barely see the 2.5 end on it in my pic. Also, I don't know if you're in a different country and that's why it is different or what, but it was a T5 Torx screwdriver for me. I am in the US. You should open up a shop. I don't have a steady enough hand to solder. I would pay a small price to have someone to do. Besides, I couldn't make it look professional. Great tutorial and welcome to the site! The tutorial doesn't belong in the Modding section. That is reserved for console firmware and things like that. I'm gonna do this next week. Thanks for the tut! I have the same problem SDmoddedlobbys... I am working on integration of bluetooth adaptor for xp400 right now - based on this excellent mod. I think i have it worked out. i will post as soon as it works. Also you can use this mod as a wired connection the way Xandrel shows it, if you don't want to mess with the bluetooth. the xp400 has a wired connection on the headset. The way i am doing it you will have the option for both just like the stock xp400.